Download "St. 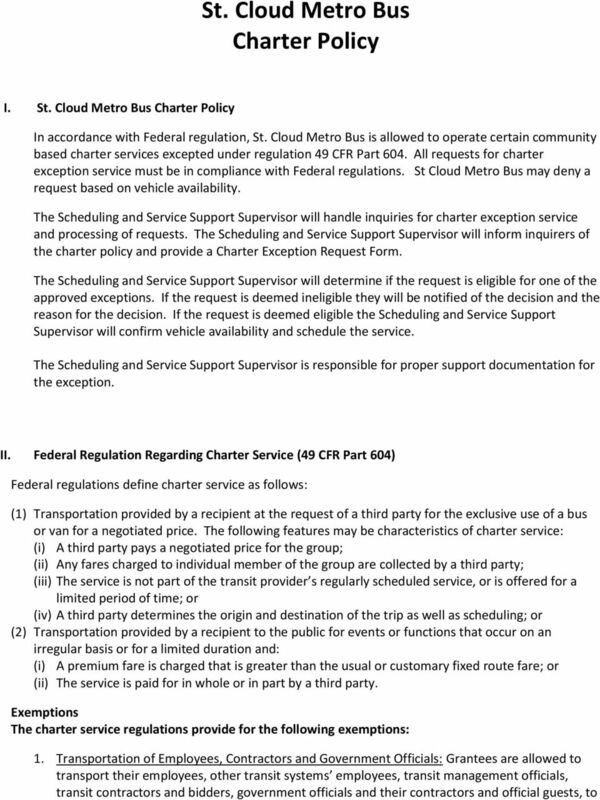 Cloud Metro Bus Charter Policy"
3 a. With mobility limitations related to advanced age b. With disabilities c. With low income If the QHSO receives funding, directly or indirectly, from the programs listed in Appendix A of the regulation, the QHSO is not required to register on the FTA s charter registration website. Otherwise, the QHSO is required to register. The grantee may provide service only if the QHSO is registered at least 60 days before the date of the first request for charter service. The grantee is required to record the following information after providing such service: a. The QHSO s name, address, phone number and address c. The number of passengers 3. 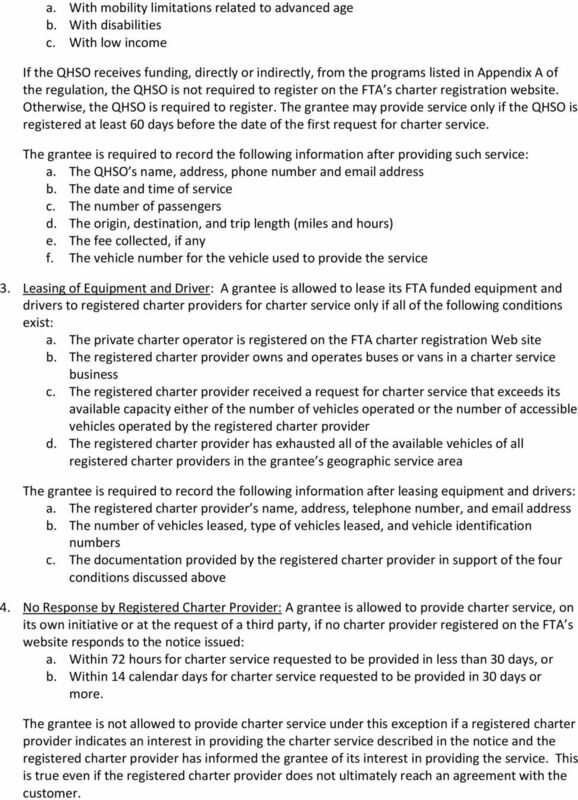 Leasing of Equipment and Driver: A grantee is allowed to lease its FTA funded equipment and drivers to registered charter providers for charter service only if all of the following conditions exist: a. The private charter operator is registered on the FTA charter registration Web site b. The registered charter provider owns and operates buses or vans in a charter service business c. The registered charter provider received a request for charter service that exceeds its available capacity either of the number of vehicles operated or the number of accessible vehicles operated by the registered charter provider d. The registered charter provider has exhausted all of the available vehicles of all registered charter providers in the grantee s geographic service area The grantee is required to record the following information after leasing equipment and drivers: a. The registered charter provider s name, address, telephone number, and address b. The number of vehicles leased, type of vehicles leased, and vehicle identification numbers c. The documentation provided by the registered charter provider in support of the four conditions discussed above 4. 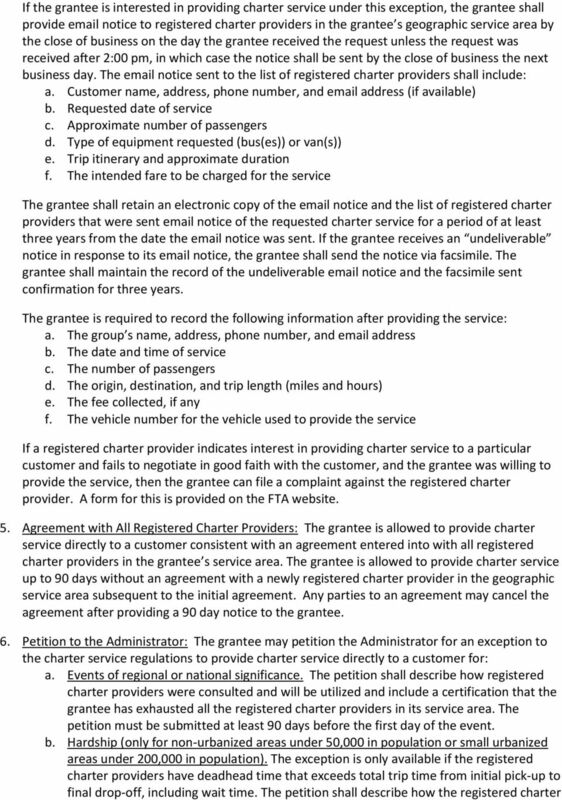 No Response by Registered Charter Provider: A grantee is allowed to provide charter service, on its own initiative or at the request of a third party, if no charter provider registered on the FTA s website responds to the notice issued: a. Within 72 hours for charter service requested to be provided in less than 30 days, or b. Within 14 calendar days for charter service requested to be provided in 30 days or more. 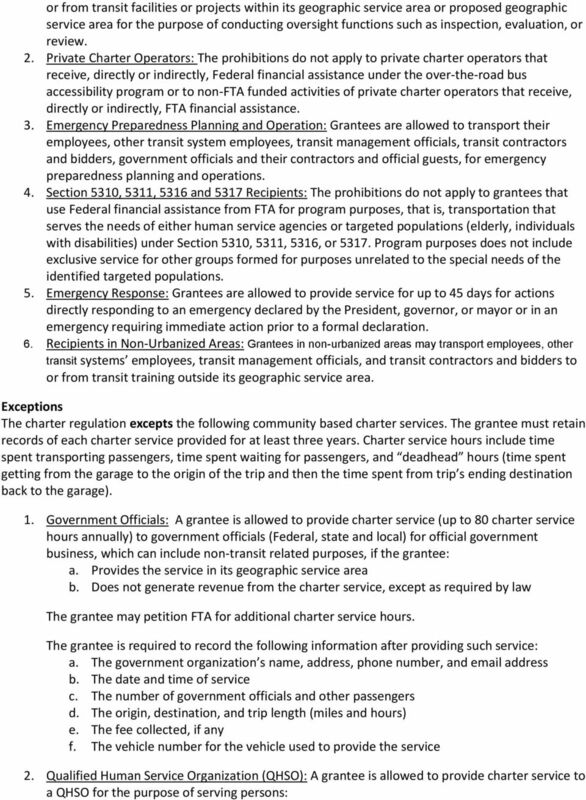 The grantee is not allowed to provide charter service under this exception if a registered charter provider indicates an interest in providing the charter service described in the notice and the registered charter provider has informed the grantee of its interest in providing the service. This is true even if the registered charter provider does not ultimately reach an agreement with the customer. 5 provider s minimum duration would create a hardship on the group requesting the charter service. c. Unique and time sensitive events (e.g., funerals of local, regional or national significance) that are in the public s interest. The petition shall describe why the event is unique and time sensitive and would be in the public s interest. Petitions to the Administrator are posted at regulations.gov, which can be accessed through the FTA charter website, so they are not reported in quarterly reports. The grantee shall retain a copy of the Administrator s approval for a period of at least three years. Programs and Funding variety of grant programs listed below. Basic Rules of Accounting the Expenses of the Operation of Vehicles in the Personal Income Tax and Corporate Income Tax System 2015. Voluntary Car Schemes. A Toolkit for Good Practice. What is a voluntary car scheme? Corporation Tax Bulletin 2004-01. Application of P.L. 86-272 and de minimis standards. The purpose of this policy is to establish guidelines for the administration of school bus contracts and school bus personnel. Company Car Tax and Related Certain Personal Income Tax Issues 2014.